← How to convert EMF to TGA? 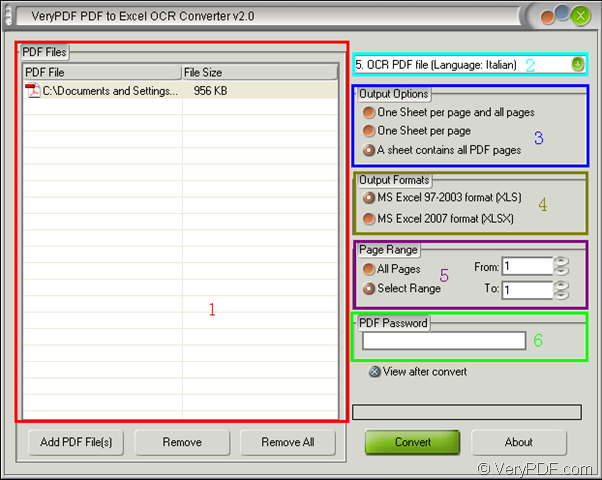 This article will put emphasis on the way of extracting Italian text from image PDF to Excel and the usage of the application VeryPDF PDF to Excel OCR Converter. 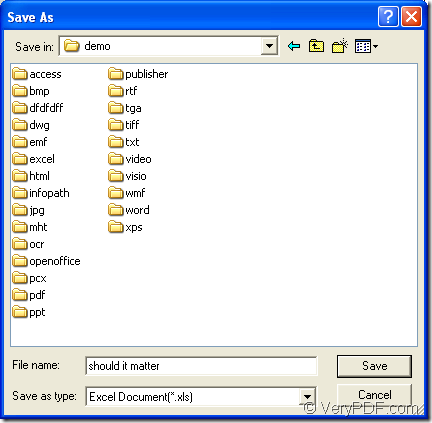 This application has the ability to convert common or image PDF to XLS or XLSX format file. It can also set some parameters for the target file. For using the application, please download it at its homepage where supplies you an evaluation version of PDF to Excel OCR Converter free of charge. Then please follow the installation wizard to install the application on your computer. When you open the application, you will see its interface which is a user-friendly one that can be accepted well by most of people. The interface is shown in Figure 1. It is mainly made up of six parts. The first part: File list. It is used to list all the added image PDF documents. To add image PDF into the file list, please right click the file list and click “Add files” option to open file picker window and choose documents from it. You can also click “Add PDF File (s)” button below the file list to open file picker window. 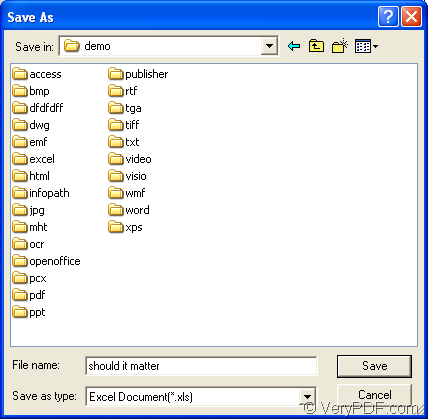 To drag and drop the documents into file list will also work. The second part: Top right dropdown list. In this dropdown list, there are seven options for your choice, if you need to convert image PDF to Excel, you need to use OCR options. To extract text from Italian PDF, please choose the fifth option: OCR PDF file (Language: Italian). The third part: Output Options group box. There are three kinds of output layouts offered for target file. 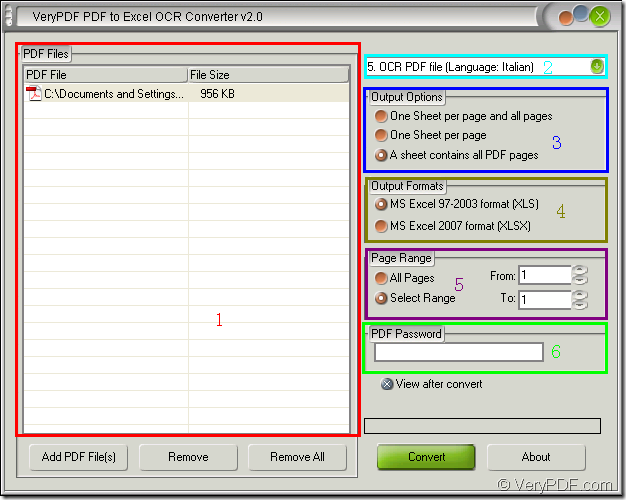 You can convert image PDF to Excel one page to one sheet or all pages to one single sheet. You can also combine these two ways together. The forth part: Output Formats group box. There are two supported output formats: MS Excel 97-2003 format (XLS) and MS Excel 2007 format (XLSX) and you can choose any one of them according to your needs. The fifth part: Page Range group box. You can convert the total pages of image PDF to Excel by checking “All Pages” option or convert several pages by checking “Select Range” option and inputting start and end page number in “From” and “To” edit boxes. The sixth part: PDF Password edit box. If the input image PDF has been encrypted and can not be opened directly, you need to input its open password in this edit box for smoothly converting. If you have added document and set parameters done, please click “Convert” button to open “Save as” dialog box. Please see it in Figure 2. You need to choose the output location and input the file name for the target file in this dialog box. Up to now, the usages of the application have been introduced and you also know how to make the conversion with this application. If there are any questions coming across you, you can contact us by leaving a message or come to our live chat support. Why pdf2txtocr.dll has stopped working? This entry was posted in OCR Products and tagged image PDF to Excel, Italian PDF. Bookmark the permalink.